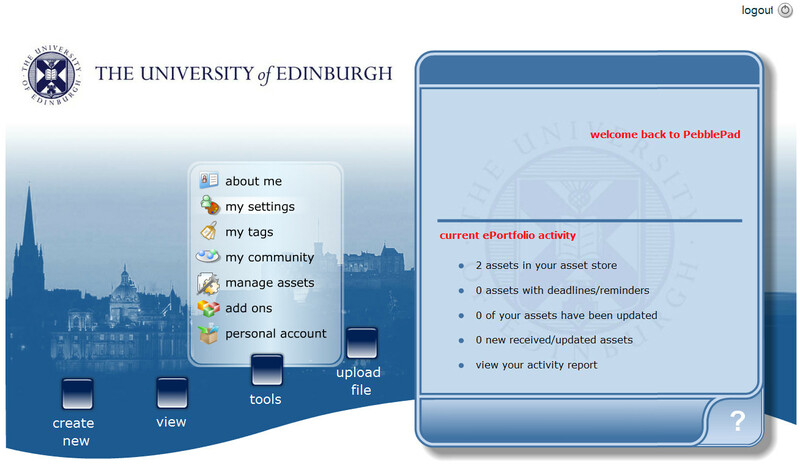 If on EASE, you can log in via http://www.pebblepad.co.uk/edinburgh/pebblepad.aspx or launch from a button on MyEd with EASE login as student (MyEd – under Studies tab) or staff (MyEd – under Teaching tab). My first experience indicated that creation of a trivial note with a few pasted web links was a very time consuming process, far beyond its value… and the resulting links note was poorly accessible with many steps to retrieve it or edit it. The system seems designed for a very small number of assets rather than many tyhousands of assets in complex structures that would be needed in a serious personal learning environment for the future.